While observing the many exhibits, she suddenly realizes she is alone. "Ib is the story of a girl of the same name going with her family to an Art Museum where displays by a famous artist known as Guertena are on exhibition. 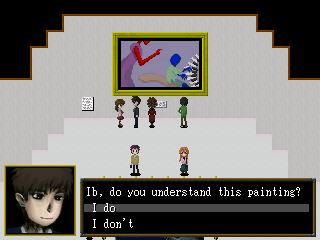 However, while wandering the art museum, Ib soon finds herself alone and, shortly, is lead to enter into a painting. On the other side, she finds a whole world of abstract and strange rooms and puzzles that she seems trapped in. 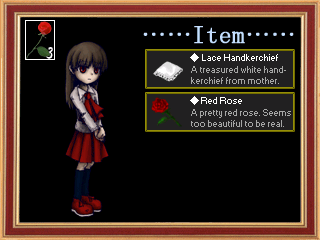 Wielding a rose that seems to represent her life, she must survive the trials of this strange painting world and try to find an escape, soon with allies that also seem trapped in the painting, slightly flamboyant and courageous coward Garry, and fun-loving but slightly needy little girl Mary. The game has a tense atmosphere at the beginning, but becomes more interesting and puzzle-focused the deeper you get into it. 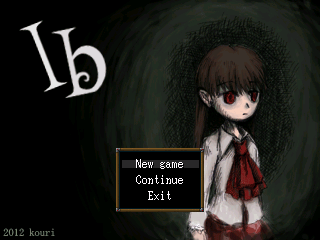 With multiple endings and a rather short length, this free game is worth it for those who like exploration or puzzle based horror games, or an interesting 2D adventure game. The creator seems to want to expand more on this universe in the future."